The reconnaissance UAVs are worth 12m dollars. On 27 July, the next consignment for technical assistance from the United States was delivered to Kyiv. "Within the framework of the European Reassurance Initiative (ERI) program , US defense department has supplied to the Armed Forces of Ukraine a considerable number of state-of-the-art unmanned aerial vehicles RQ-11B Analog Raven Systems worth more than 12m dollars," the General Staff of Armed Forces of Ukraine said in statement. The UAVs are not equipped with weapons. 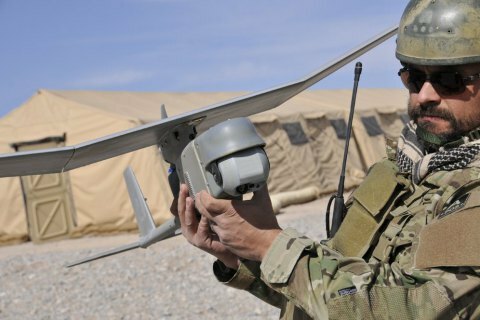 RQ-11 Raven is a reconnaissance drone, weighing less than two kilograms, has a digital camera, including infrared night vision. The peculiarity of this type of aircraft is the ease of starting. They are undemanding in terms landing site. Its flight endurance is of 60–90 minutes and an effective operational radius of approximately 10 km. The UAV can provide day or night aerial intelligence, surveillance, target acquisition, and reconnaissance. Earlier, the Ministry of Defence revealed the data regarding logistical and humanitarian assistance to the Armed Forces of Ukraine from partner country governments. The aid from the United States was the greatest.